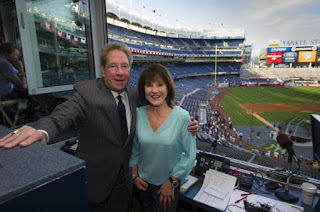 Subway Squawkers - A Yankees-Mets Rivalry Blog: Human sacrifice! Dogs and cats living together! Me rooting for the Red Sox? Mass(achusetts) hysteria! Human sacrifice! Dogs and cats living together! Me rooting for the Red Sox? 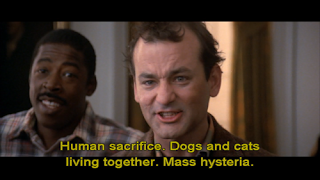 Mass(achusetts) hysteria! This is what a Yankees-Blue Jays pennant race means -- we Yankee fans have to root for Boston to win some games. Specifically, the six games they have against Toronto this month, including the three this week. Isn't that a stomach-churning notion? How am I supposed to deal with that? It reminds me of that famous "Ghostbusters" scene (YouTube video below) about dogs and cats living together. Talk about Mass(achusetts) hysteria! Does this mean I have to start talking about how to "Pahk the cah on Hahvahd Yahd"? Think that Denis Leary is funny? Listen to Aerosmith and New Kids on the Block? Oh, the humanity!